Network to increase your net worth. Maxx Contacts helps to capture all details of various business contacts like Customer, Vendors, Sales Persons, Users, etc. Using Maxx Contacts, users can easily find a contact, send Bulk SMS/Emails, quickly print mailing labels, print phone diaries & envelopes, get birthday/anniversary reminders. It helps users to stay more connected with their contacts which in turn leads to increased business volume. Current day Business is all about contacts.Contacts play a very big role in every successful business and to maintain them effectively is the need of time. MaxxContacts business booster helps you capture all the important information of contacts in a detailed way. 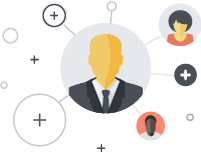 MaxxContacts helps its users to keep in touch with their contacts via MaxxAlerts -SMS and Email Booster that helps in transparent business communication between the contacts to have a better clarity which is very much essential to run a successful business. All essential details of a contacts are captured. Multiple Billing and Shipping address can be captured for a single contact. All key contacts details are captured. Contacts book and diary reports. Execute a marketing campaign in clicks. Easy bulk envelopes and mailing label generation.